At Treasure Coast Window Fashions serving West Palm Beach, we’re always happy to help our customers get just the right window treatment to meet all of their needs. 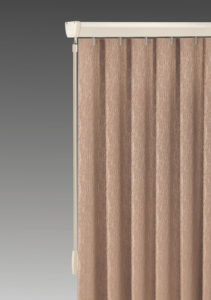 And when it comes to large windows like sliders or patio doors, we have a great selection of Hunter Douglas vertical blinds. Even when opened, they provide a visual art-like frame on your door. They’re fashionable and functional at the same time. The Hunter Douglas vertical blind collection includes Cadence® Soft Vertical Blinds which feature two soft S-shaped louver styles; Somner® Custom Vertical Blinds which complement any décor, from traditional to contemporary; Vertical Solutions® Vertical Blinds which is affordably priced and features both fabric and vinyl vane options; and Skyline® Gliding Window Panel Blinds which can cover large windows up to 23 feet. Vertical blinds are a beautiful part of the décor within your home, adding an area of beauty and interest to a room. You’ll not only enjoy the privacy they provide, but you will realize energy savings, as they prevent the sun from entering the room in summer or heat loss in the winter. If you are looking for more of a drapery look and feel, but like the functionality of a vertical blind, Hunter Douglas offers Luminette® Privacy Sheers and Provenance® Woven Wood Vertical Drapery. Hunter Douglas blinds come with easy-to-operate with standard manual systems, such as PermaTilt® Wand Control which is a single wand that provides traverse and rotation control. The PermAssure® Safety Wand operates with a simple twist. It completely eliminates the external chain and cord, providing enhanced child and pet safety. Chain Tassel and Cord Tensioner is the most basic operating system. Simply pull the chain to rotate the vanes, and pull the cord to traverse the blind. The tensioner provides added safety by keeping the exposed cords out of reach of children and pets. Or go motorized with the Motorized Tilt-Only System This system will allow you to rotate your vanes and stop them at any point. It also comes with a cord for you to manually traverse the vanes. It requires no special wiring and can be operated with an infrared remote-control unit or a table- or wall-mountable switch. 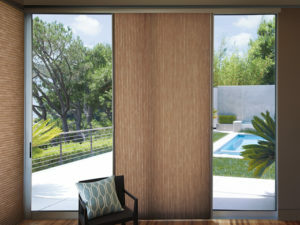 Treasure Coast Window Fashions provides more than just the finest window coverings. Our owners are involved in every project from start to finish to ensure your window covering project exceeds your expectations. We’re proud to serve the greater West Palm Beach area including Juno Beach and Tequesta. Please contact us at 772-220-8870 or visit our showroom in Stuart, FL, for more information about our products and services. Contact us to learn more.